Georgia State was 20-0 when leading at halftime this season entering its Sun Belt Conference tournament semifinal on Saturday. The team is now 21-0 in that regard and one win away from reaching the NCAA Tournament after holding on to a 13-point halftime lead over Texas State. 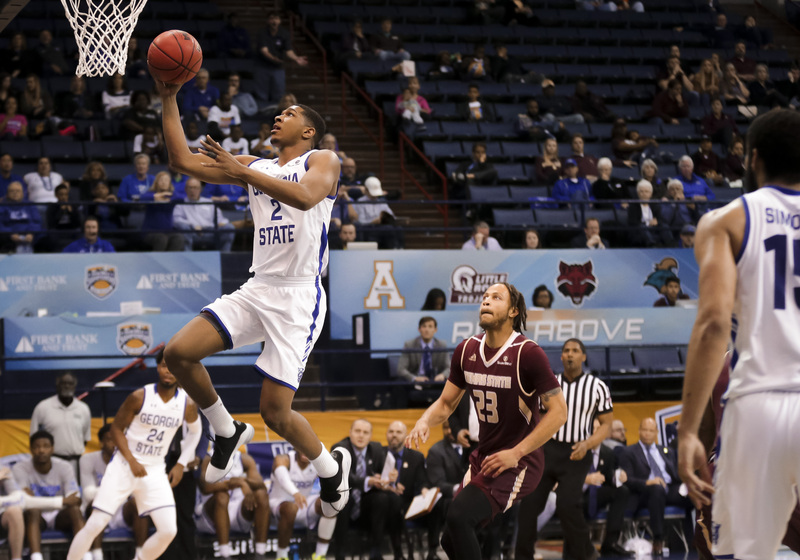 A win in the finals on Sunday against Texas Arlington would clinch Georgia State’s second straight NCAA Tournament berth. It’d be the program’s third berth and conference tournament championship in five years. A dominant defensive performance was the key to this Panthers victory. Georgia State led 28-15 at halftime. The Bobcats’ 15 first half points are the fewest a Sun Belt team had during any half this season. Georgia State’s lead was larger than Texas State’s total points scored after a Jeff Thomas 3-pointer made the score 28-13. The Bobcats shot 4-of-23 in the first half. They went over 9 minutes without scoring a field goal during the slow start. Georgia State stretched the lead to 22 points during the second half and won 59-46. The Panthers held the Bobcats to 21.3 percent shooting and 5-of-26 on 3-pointers. Texas State All-Sun Belt First Team selection Nijal Pearson didn’t score during the wire-to-wire loss. Just one Texas State starter, Tre Nottingham (13 points), scored in double-digits, and even he was inefficient, shooting 3-of-12. Georgia State was ineffective on offense too. The Panthers turned the ball over 15 times and shot 32.1 percent. Luckily for the Panthers, the Bobcats had 18 turnovers. Georgia State has forced 18 or more turnovers in seven of their last eight games. Malik Benlevi had a double-double with game-highs of 15 points and 10 rebounds. Jeff Thomas scored 11 points, and D’Marcus Simonds finished with 11 points. Thomas and Simonds were 3-of-12 and 2-of-10 from the floor, respectively. The Sun Belt Conference championship game is broadcast Sunday on ESPN2 at 1 p.m.